When the Greek government decided at short notice to call a referendum it was clear that the differences between the Syriza-led coalition and the IMF/ECB/EC Troika were minimal. When it came to the referendum campaign the differences between No and Yes sides, despite much melodramatic language, were, therefore, also limited. Greek Finance Minister Varoufakis accused the Troika of trying to “humiliate” Greece. “Why have they forced us to close the banks? To frighten people. And when it’s about spreading terror, that is known as terrorism.” (El Mundo 4/7/15) Syriza claim that the purpose of the referendum was to improve the negotiating position of the Greek state. Meanwhile, the proponents of the Yes vote warned of the disastrous consequences of an exit from the Eurozone and the possibilities of leaving the EU. Both sides mobilised the population as so many atomised individuals blindly following the campaigns of the bourgeoisie. A Greek professor quoted in the New York Times (3/7/15) said “There is no discussion of the real issues … They are exaggerating the feelings of fear and agony and creating an atmosphere that makes it impossible for anyone to think clearly.” Thinking clearly is something that the bourgeoisie discourages at every opportunity. What it needs are millions trooping into polling stations to express their passivity in the face of the bourgeoisie’s economic attacks. When the coalition led by Syriza assumed office after January’s election it claimed that it would end austerity. Many naively believed that this was possible. The negotiations with the Troika were undertaken in an atmosphere of charge and counter-charge. However, as the June 30 deadline approached, when Greece would default if there was no agreement producing new funds, it seemed as though agreement was imminent. But the Greek government walked out of talks a few days before the deadline. Even after the deadline Syriza continued to make concessions on the measures proposed by the Troika. In the end the sticking points were matters of detail. The Greek government accepted most of the proposed changes to VAT, with the exception of the special treatment of the Greek islands. It accepted most of the attacks on pensions, but not all. On defence cuts there were initially no concessions made by Syriza at all. After all national defence is one of the central concerns of every capitalist state, whether led by a party of the left, right or centre. In the end what was offered by the Greek state was close to what was demanded by the Troika. As far as the austerity experienced in Greece over the last five years is concerned the prospect is only for the situation to worsen. The US and the IMF might speak more of restructuring debt relief, the EC/ECB more of the particular measures that must be introduced, and Syriza more about the suffering of the Greek people. No one can offer any improvements in the actual conditions of life of those living in Greece. Both Yes and No campaigns, apart from describing the impossible horrors of supporting the other side, insisted that following them would restore Greek pride. Both sides posed things in terms of the Greek nation, the Greek people and the Greek economy. Nationalists tell us that Greek workers should be proud of the fact that the Greeks work among the longest hours in Europe, despite the fact that this shows them to be among the least productive. The quality of Greek agriculture is often extolled, and yet 70% of food consumed in Greece is imported. In the final analysis Greek capitalism has proven uncompetitive and has lost out to larger and stronger economies. The problems of the Greek economy are not due to the particular Hellenic problems of corruption and the non-payment of taxes (widespread though they are), but are an expression of the international crisis of decadent capitalism. In reality in Greece there is no prospect for a reduction in unemployment, many taxes rise, wages and pensions will be further reduced, the age of retirement will go up to 67, and further public services will decline because of a lack of viability. In practice, for all their talk of opposition to austerity, Syriza have shown themselves in continuity with the governments of New Democracy and Pasok that preceded it. 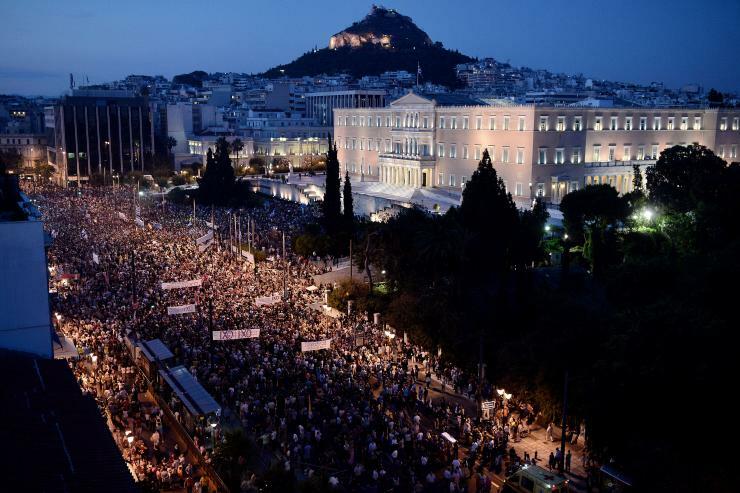 If the population in Greece has suffered the rigours of sustained austerity, it is not unique. The economic crisis of capitalism, as it worsens, always means the capitalist class will make the working class, and other non-exploiting strata of the population, pay … in reduced wages, lost jobs, higher prices, cut services, and ultimately in imperialist war. The anti-austerity rhetoric of parties such as Syriza is exposed as just so many words as soon as they are part of government. But the working class does not only suffer from privation and pauperisation, it also faces capitalism’s ideology and its apparatus of democracy. In Greece, in the past there have been many general strikes ‘against austerity’, but these have been very much initiated, controlled and divided by the rival union federations. Far from developing any sense of class identity or the possibility of autonomous action, the unions have pulled the workers into relying on factions in parliament and supported the parties of the left. In the past this meant the social democrats Pasok and the Greek Stalinists (KKE), more recently it’s meant Syriza. The fierce polarisation of Greek bourgeois politics continues to draw in the working class. Coups and counter-coups in the 1920s and 30s, the dictatorship of Metaxas, the Civil War in the 1940s, the regime of the colonels (1967-74), the emergence of Pasok and New Democracy – all these past expressions of divisions within the ruling class have found workers rallied behind factions of the bourgeoisie rather than against it. Although the question posed in the referendum was of Byzantine complexity, the answer was reduced to a choice between ΝΑΙ or ΟΧΙ (Yes or No). ΟΧΙ is not a neutral term in modern Greek culture. Every 28 October in Greece is ΟΧΙ Day, a national holiday celebrating the refusal of Metaxas of an ultimatum from the Axis powers and the entrance of Greece into the Second World War. In Greece today the political parties of the bourgeoisie compete to display their nationalist credentials. None of them can offer anything but further austerity and war. It will be a great step forward for the working class when it realises that its interests are diametrically opposed to those of the bourgeoisie. In the past there have been political minorities in Greece that have defended the perspectives of working class revolution. During the 1940s the group around Agis Stinas defended an internationalist position against the Second World War. More recently there were internationalist voices during the social movements of 2009-2011 The way forward for the working class in Greece, even if it is not an immediate prospect, is to link its struggles with those of the world working class and to develop a truly internationalist and revolutionary perspective.